I'm a little annoyed because I'm pretty sure I posted this recipe a while back. A quick glance through my archives made me realise that the post had somehow been deleted. Never mind! Better late than never. I made this back in May when I put on a lunch spread for some friends who had never tried Nigerian food before. I made sure the mains were typical Nigerian fare - jollof rice, plantain, stew, efo riro etc. etc. (it was quite a feast) - but when it came to dessert, I wanted to try something different. 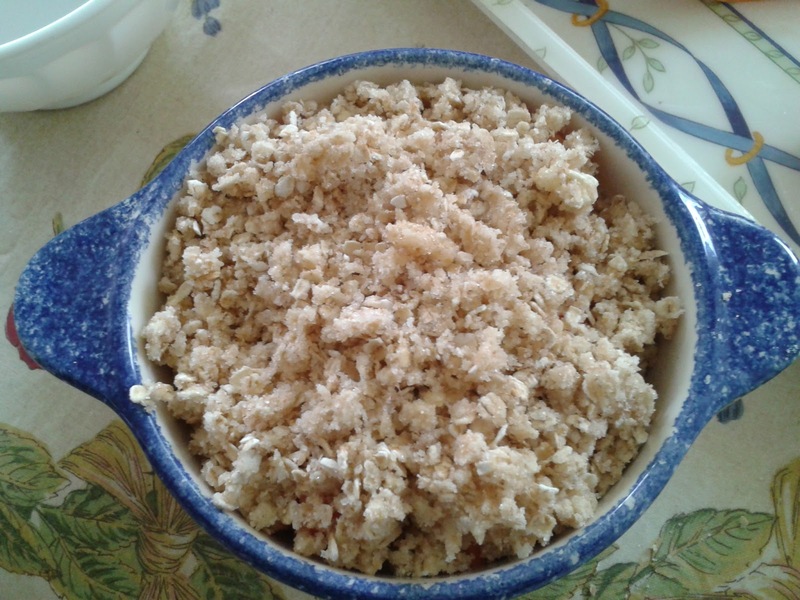 I suppose I'll have to call this one a fusion dish because a crumble really is the quintessential English pudding. I've just given it an exotic twist with some juicy pawpaw (a.k.a. papaya) instead of the traditional apple. Once upon a time, we had a pawpaw tree in our backyard. It served us well and was a source of many glorious moments spent gnawing through refrigerated mounds of bright orange goodness. Then one day its roots went out of control and nearly destroyed a part of the wall surrounding our compound. It got chopped down and uprooted and I doubt I've ever really gotten over it. Pawpaw is high up there on my list of favourite fruits, along with mango and orange. It's packed with a load of vitamins (A, B, C), potassium, calcium and fibre. It's also low in calories at around 40 calories/100 g. Sweet! 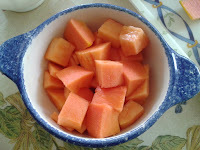 Place the cubed pawpaw at the bottom of a baking dish and squeeze on some lemon juice and sprinkle on 1 tsp of cinnamon. Give it a good mix and leave to the side. To make the topping, place the flour, oats, sugar, 1 tsp of cinnamon and vegan butter in a large mixing bowl. With clean hands, bring the mixture together gently until it resembles thick breadcrumbs. 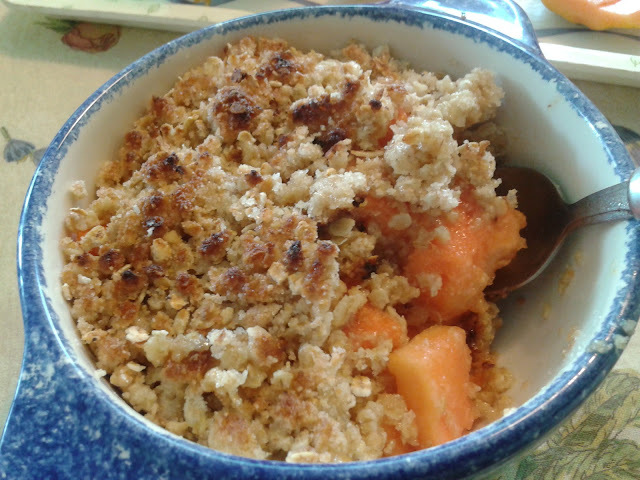 Spread the crumble mix evenly over the top of the pawpaw and bake in a pre-heated oven, gas mark 6, for about 30 mins, making sure the top is nice and golden brown.